Jean-Baptiste Monnoyer, one of the greatest of French baroque flower painters, depicted blooms in every guise from a single flowering twig to elaborate arrangements of flowers in stone urns with tapestries and architectural backgrounds. This charming pair of paintings shows him working on a small, intimate scale, applying his genius to modest bouquets tied with blue ribbon. 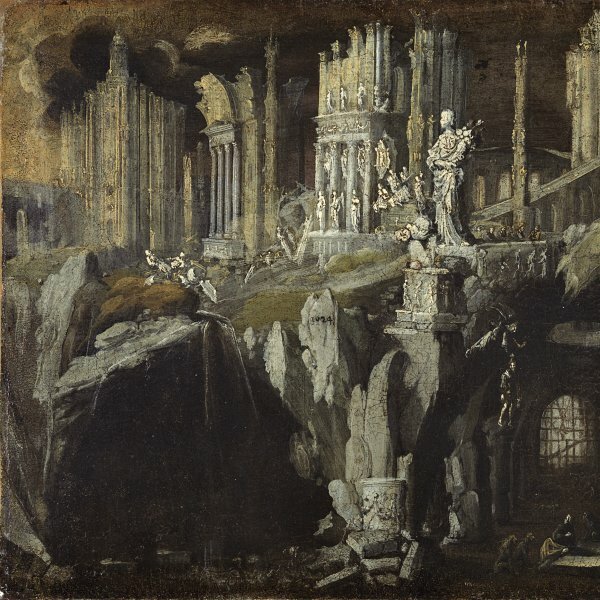 Because Monnoyer is working on the small scale of a "cabinet painting", these works are more delicate and highly finished than his large-scale decorative flowerpieces. The first painting depicts York-and-Lancaster roses, so called because they combine the white favoured by the house of York with the red of the Lancastrians, (Rosa x damascena cv. Versicolor), poppy anemones (Anemone coronaria pseudo-plena lavandulo-alba), double campernelle (Narcissus x odora Plenus), a hyacinth (Hyacinthus orientalis), a tulip (Tulipa chrysantha x T. clusiana) and auriculas. The second bouquet consists of French roses (Rosa gallica ab R. x provincialis), single yellow roses (Rosa foetida), orange blossom (Citrus aurantium), and two types of carnation (Dianthus caryophyllus plenus albo-violescens and Dianthus caryophyllus plenus albo-cinnabarescens). All are species familiar in Monnoyer's work and highly regarded, though not excessively rare, in French aristocratic gardens of the 17th century. A pair of flower paintings sold at Christie's London on 7th September 1995, lot 36, 46.3 x 39 cm, replicates many of these species in different arrangements. Monnoyer mixes spring flowers like the hyacinth with the flowers of summer, such as the roses. Although each bloom has a freshness and immediacy which suggests that he studied it from life, like most 17th-century flower painters he worked from exquisitely-executed drawings made as each flower came into season, and kept as an important reference archive. His brilliance lies in the orchestration of the whole. He enjoyed painting lavish, sculptural flowers, round in form: the heavy-headed French centifolia roses, the fluffy white Roman chamomile, which is almost a leitmotif in his work. 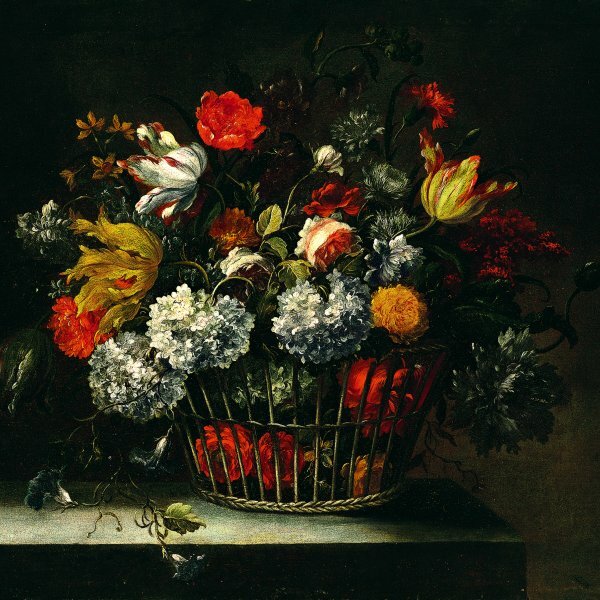 The flowers are placed against a dark background and raked with serpentine baroque light, so that they seem to nod in a balmy breeze. Dominant in both paintings are the light pink and white roses, their soft petals spilling open in the spotlit foreground. Monnoyer contrasts dense with delicate flowers and warm with cool colours. The fragile, twisting blue petals of the hyacinth at the top of one bouquet are balanced and echoed by the toning blue ribbon at the bottom. In the second painting, orange blossom provides the cool accent to set off the hot red of the carnation and the yellow Rosa foetida. Although this pair of paintings is a comparatively restrained example of Monnoyer's art, his fluid and painterly treatment and vibrant use of colour is typical of the Franco-Flemish tradition in which he grew up. Born in Lille, he first studied history painting in Antwerp before moving on to decorative painting in Paris by 1650. Contemporaries praised his realism and his reputation rode high throughout the 18th century. His flowers decorated French royal palaces as well as the mansions of the British aristocracy, where many remain in situ today. 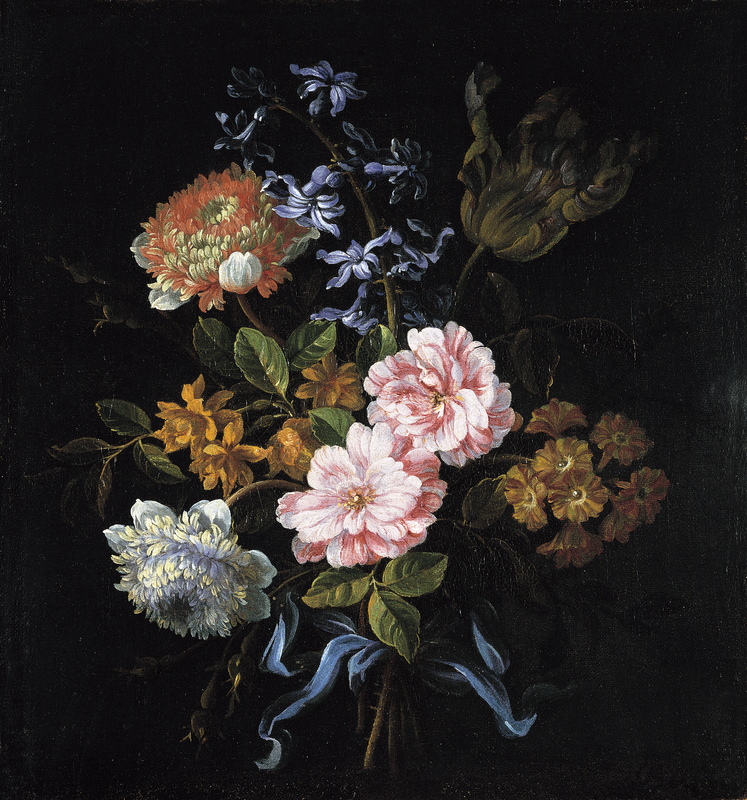 Above all, Monnoyer's work testifies to the lavish love of flowers and gardening in the age of the baroque.